As rumors have been flying around news is bound to make an appearance. Many are expecting to hear about Episode VII but to be honest, knowing the history of Lucasfilm, the prequels and special editions were kept pretty tight until Episode III was due out. But to appease the fans, there is some talk from JediNew UK. During the summer there was a lot of tension within certain ranks at Lucasfilm, especially regarding the pressure over no news announcements and the exceptionally high levels of fan expectation. The mood is very different now. My impression is that there is clarity and relaxation over what is happening. Expect quick movement on announcements, with continual announcements timed for the rest of the year. This is their pre-determined method on how to control the media and satisfy the thirst for information. It will be drip fed out. That’s why there were no major summer announcements, as there’s no need to feed the hunger quite yet. So one of the tidbits of news that has come out, is the voice casting for the new animated series Star Wars Rebels. It was recently revealed from The Hollywood Reporter who are being considered as the lead roles. So not quite the news people have expected, and we still can’t expect Episode VII news til late October as a promise of news will be coming out. But still exciting to hear some news about the Star Wars universe and who might participate in the future of the series. 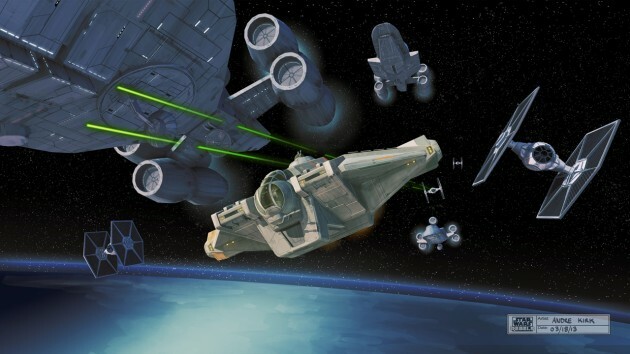 Star Wars Rebels is due to hit in Fall 2014.